Hi guys! Not much is going on here. We went to see the last Maze Runner movie this weekend (meh), and stayed in the rest of the weekend due to rain. The weather was really nice today, and I'm hoping that trend sticks around for awhile. 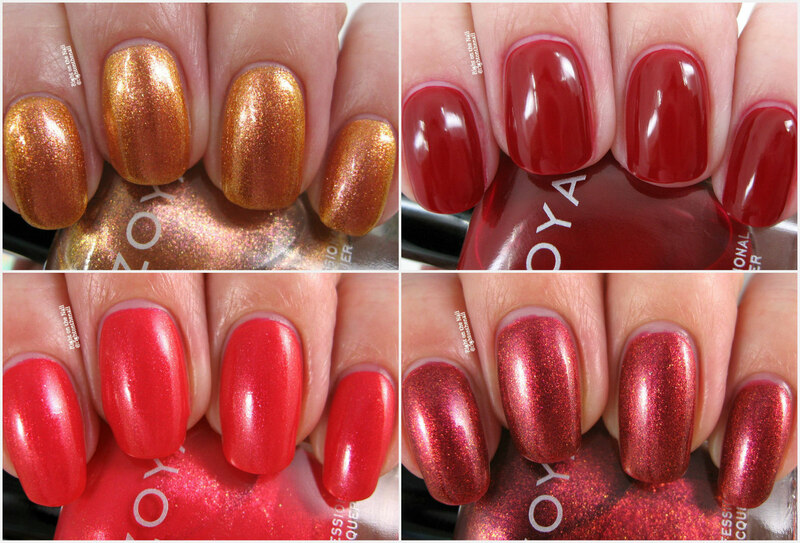 Tonight I have the final set of Zoya colors from the Party Girls Collection. I should also mention that I just received the Bridal Bliss set, so I hope to start swatching those soon. There's only 1 brand new polish in the set, but I believe there are a few I haven't reviewed before. Shall we finish this up? Nadia can be used as a topper, or on its own as I did here. It's a bronze base with gold, bronze, and rose gold microflakes. Since it's a topper, it's no surprise that it was the sheerest of the collection. It built up to full opacity with 3 coats, and dried with little texture even with the flakes. The collection has 2 red cremes, and Sheri is the darker of the 2. It's more of garnet red, while Ming was a tomato red. Zoya calls this a creme, but it's really a jelly finish that dries shiny. The formula was good, but you'll need 3 heavier coats for full coverage. Be careful around the cuticles applying and removing this one, because it stained my skin a little. You know Solstice is a top pick for the collection! Give me a bright coral shimmer, and I'm one happy lady. It's really a nice mix of orange and pink without leaning one way. The shimmer looks to be gold and pink without being too in-your-face. What a summery shade for a winter collection, right? I went ahead and used 3 coats for the photos, but you could likely get away with 2 depending on your application. There is minimal texture which goes away completely with even a thinner top coat. Whoop, another top pick for me! Is it just me, or do you instantly think of Tawny Kitaen from the Whitesnake video? Go ahead and click that link to see which song I'm talking about. You're welcome. Tawny the polish is a deep rose gold base with magenta and gold microflakes. The base isn't exactly rose gold because it has a bit more red in it, but close enough. It's basically Nadia with a different colored base. There you have it everyone! This was a big collection, but I was happy to see a variety of colors and finishes. It was a bit purple-heavy, but I'm sure that made most of you very happy. My top picks have to be Danielle, Isadora, Solstice, and Tawny. Zoya polishes retail for $10 and you can find out more about them on their website, Facebook, Twitter, or Instagram pages. Keep an eye out for them in your local Ulta store if you want to see the bottles in person before you buy.